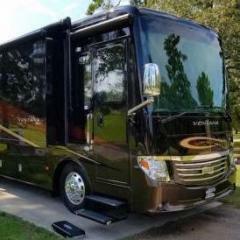 (Just looking to vent) We have 2011 Newmar Ventana diesel 40' that we bought in the fall of 2017 and it has been one big money pit. Clutch fan assembly fell off an hour north of the highway driving from the dealership. (7k) had to be towed. Supposedly Spartan no longer makes that particular Cumins fan assembly and had to be rebuilt. Turbo replaced ($7k) Had to be towed once more. Current problem is that both roof AC units no longer work and it is $4k just for the units and need to add labor cost. And much more such as the front window day shade mounts are so poorly made that the shade had fallen off onto the dashboard not once but twice. Removed it and put it into the basement. To get any work done by Newmar or by the dealership it is a four-month waiting period. Obvious new sales take precedence over existing customers. And because it is not warranty work, you can forget about Newmar ever considering covering the cost. Luckily the dealership covered the cost of the first issue of the fan assembly. All other costs have been paid by us. Newmar is supposed to be a top brand. I am furious at them. Bought only last Aug of 2017 and now we are going trade it because we need a reliable unit for my work. We travel all over North America. All total we will lose about 50k to 60k when we trade it in for something more reliable. We are contemplating buying a new tag axle but Newmar can forget about it. For all those who buy a new or used Newmar, God bless you, and I hope it is treating you well. I understand your frustration but I will point out it doesn't appear you should be mad at Newmar but rather the manufacturers of the components you've needed to repair/replace. Newmar didn't design, build or install the Cummins engine, etc. I do question why you needed to replace the "instant water heater" for $3.6 when you could have repaired it. Likewise with the Atwood electric jacks. I wish you success buying and owning your next coach. I kind of go along with Jim S. Did you by any chance get any Service Record with the coach? I can feel your frustrations and hope you are able to resolve your majors issues with the Coach. Let us know how is all pans out. My condolences also. You have come to the right place to ask questions and guidance. My first response about the AC's is to look on line for prices for replacement units, and find a competent person to replace them. Both units installed (if you really need them) should be less than $2K. Thanks for venting, it reminds us that there are crooks lurking all the time. Sorry for all your problems. Sounds like you purchased a used coach that had not been service or taken care of very well. Did you consider an extended warranty when you purchased a 6 year old coach? If you had your post probably would have been titled "Have Now Made Over $5,000 On My Extended Warranty". You may be surprised what Newmar would cover after the warranty is expired, however the issues you listed were not built by Newmar. I searched for a used Tiffin or Newmar but couldn't find one that I thought would fit our needs. The one possibility we found was an extremely good price but was a piece of crap and had not been taken care of (43' Tiffin), so we passed on it and ended up purchasing new. Our experience has been Newmar is a great company that stands behind their product and they are certainly treating us well. Good luck on your next non-Newmar coach. There are many out there to pick from. TD, thank you for sharing and I can understand your frustration. 2011 ANY coach is likely to be a headache, and to narrow it down most built between 2007 and 2016 would also be a concern of mine. When the economy flipped so did quality, not just with the coach builder finding ways to build them for less but the parts and materials suppliers also did. A few manufactures in those years were sourcing materials from over seas and adding labels to their interiors warning the occupants not to be exposed to these materials longer than 12 hours in a 24 hour period. Add one more layer Govt regulations on diesel emissions were gradually getting tighter while everyone was struggling to keep the lights on spending millions they didn't have to meet the govt mandates. I'm not making excuses for these manufactures what they did was terrible, but it wasn't just one manufacture, you will find that this was across all coaches until you step up into the custom high end lines in those years. You need to give this consideration when making your next purchase so you don't get deja vu next year talking about your 2014 Tiffin. The OP didn’t say what was wrong with the Atwood jacks. While some whole jacks are available to replace, the power control board is not. I finally gave up soldering to the etches to connect the control wires. Replaced yesterday with HWH. Cost was more thane OP paid, but I have had HWH before and would not replace my Atwood jacks with Lippert/Atwood jack system. I also feel your pain! Agree with all above. Newmar is not your problem. I have a American Coach, 2010 , been thru most of what you listed. Not the Brands problem, most components, are from pre-2007! Had a new 2011 Tiffin, Allegro Bus...POS ! Again it was the components! Pre 2007 or newer than 2015 is the answer, on any cookie cutter brand !! !